You probably have at least one box of baking soda in your home right now. If you’re like many South Africans, you might have a box in your pantry for baking, one in your refrigerator to absorb odors and another under your kitchen sink to use for cleaning. What you might not have considered is that baking soda can be used for health purposes, too, so you might want to stash another box in your medicine cabinet. What Exactly Is Baking Soda? It’s 100 percent sodium bicarbonate, which can be used as a leavening agent in baked goods. When mixed with an acid, baking soda reacts, making bubbles and giving off carbon dioxide gas, which causes dough to rise. Anecdotal reports throughout history suggest that many civilizations used forms of baking soda when making bread and other foods that required rising. You can purchase a box of baking soda for under R20.00, making it one of the least expensive home remedies to keep on hand. In addition to using it for minor accidents and injuries, baking soda can become a part of your regular hygiene routine. If you want to avoid the parabens and aluminum found in many deodorants and antiperspirants, try a pinch of baking soda mixed with water instead. This simple paste makes an effective and simple natural deodorant. You can also simply brush some dry baking soda under your arms. Apply a paste made of baking soda and water to insect bites to help relieve itching. You can also try rubbing the dry powder onto your skin. This is also effective for itchy rashes and poison ivy. Baking soda helps to relieve minor skin irritation and itching by neutralizing toxins and irritants on your skin’s surface. Most over-the-counter antacids contain some form of bicarbonate. Baking soda works by immediately neutralizing stomach acid, helping to relieve heartburn, indigestion and even ulcer pain. I have personally recommended this to many, including family members, and have been surprised how remarkably effective it is. This should only be used as an occasional (not chronic) treatment, however, and be careful not to consume excessive amounts, which can cause serious electrolyte and acid/base imbalances. Add three tablespoons of baking soda to a tub of warm water for an invigorating foot soak. You can scrub your feet with a baking soda paste for additional exfoliation. A paste made from three parts of baking soda combined with one part water can be used as an exfoliator for your face and body, too. It’s natural, inexpensive and gentle enough to use every day. Baking soda and apple cider make a wonderful spa-like bath for soaking. It also cleans the tub and the drain, as a bonus! Mix three parts baking soda with one part of water to make a natural hand cleanser that will scrub away dirt and neutralize odors. Add ½ cup of baking soda to lukewarm bathwater, then soak in the tub for natural relief. When you get out, let your skin air dry, rather than toweling off the excess baking soda, for extra relief. You can also add a mixture of baking soda and water to a cool compress and apply it to the sunburn directly. Baking soda has a mild abrasive action that helps to remove plaque and polish, clean, and deodorize your teeth. One review of data from five controlled clinical studies found that toothpaste containing baking soda “enhanced plaque removal effectiveness of tooth brushing to a significantly greater extent” than brushing with a non-baking soda toothpaste. Baking soda also has antibacterial activity and has been found to kill Streptococcus mutans bacteria – a significant contributor to tooth decay. For an incredibly effective tooth and gum paste, use a mixture of six parts of baking soda to one part of sea salt. Place them in a blender and mix for 30 seconds, then place in a container to use. Wet the tip of your index finger and place a small amount of the salt and soda mixture on your gums. Starting with the upper outside gums and then the inside of the upper, followed by the lower outside of the gums then the lower inside, rub the mixture onto your teeth and gums. Spit out the excess. After 15 minutes rinse your mouth. This mixture is incredibly effective at killing bacteria. You need to exert some caution in this area though as many believe baking soda can be too abrasive on your enamel, and Dr. Curatola believes that killing the oral microbiome may be highly counterproductive. For a natural way to whiten your teeth, crush one ripe strawberry and mix it with 1/2 teaspoon of baking soda. Spread the mixture onto your teeth and leave on for five minutes. Then brush your teeth and rinse. This method should be used no more than once a week, as excessive use could potentially damage your tooth enamel. 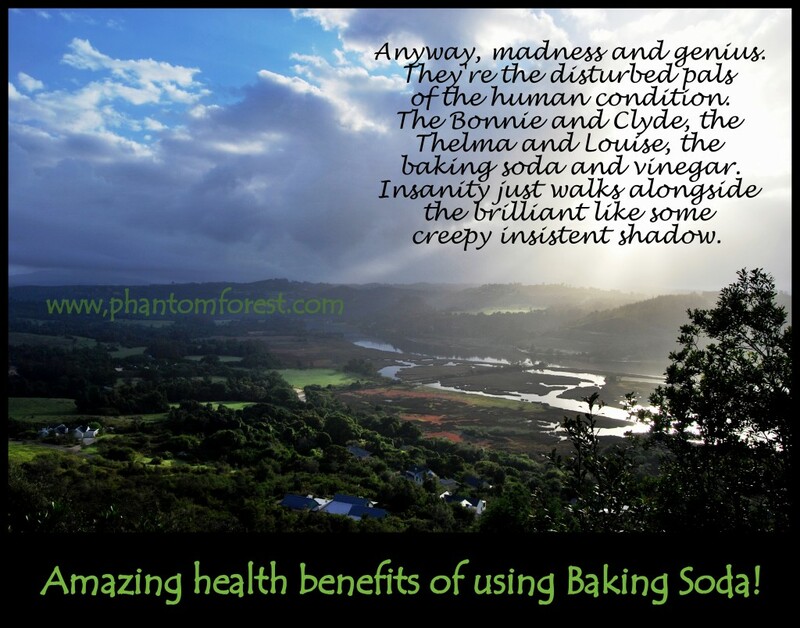 This entry was posted in From the Phantom Body Boma, From the Phantom Forest, Uncategorized and tagged baking soda, health. Bookmark the permalink.